Knowing how to properly thread your sewing machine is the first step to having a machine that will sew correctly so that you can enjoy sewing without the frustration that a malfunctioning sewing machine can cause. 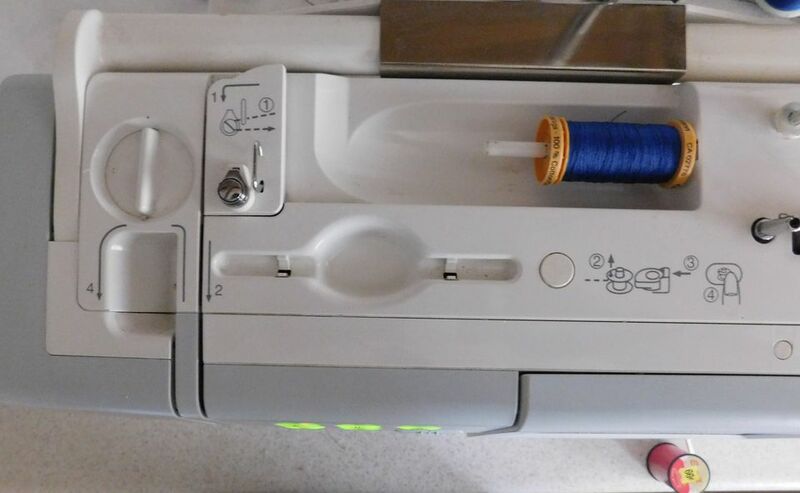 Most newer sewing machines have the threading guide printed on the sewing machine plastic. Older sewing machines do not have the same type of printing but a threading guide may be inside a door on the left-hand end (as you are looking at the front of the machine) of the sewing machine. Almost all sewing machines thread from the spool of thread on the right side (as you are looking at front of the machine) of the sewing machine and follow a path through various guide working to the left side of the sewing machine to the sewing machine needle, however I have seen one Singer sewing machine that threaded in the opposite direction rather than the "normal" direction. Having the sewing machine manual for your sewing machine is the best guide. Starting at the thread spool holder, bring the thread across the top of the sewing machine. Follow the guide which goes downward toward the machine needle but then up toward the sewing machine again. From the top of the machine guide the thread downward toward the needle, watching for threading guides along the way. A threading guide can be a coiled wire or a bracket that holds the thread toward the machine. Watch for guides near the machine needle so the thread is controlled as it enters the needle. Whenever you are threading a sewing machine, one basic rule to every sewing machine is to thread the machine with the presser foot up. When the presser foot is raised, the tension disks are disengaged. Being disengaged allows the thread to go into the tension disks and seat properly. If you try to thread the machine with the presser foot down, the tension disks are engaged or tight and will not allow the thread to seat in between the disks. Thread the sewing machine with the presser foot raised. Once you have the thread through the needle, tug the thread. You should be able to easily pull the thread through the machine. Without the thread being under the presser foot and being careful that you do not bend your needle, lower the presser foot. Now when you tug on the thread, you should feel a definite drag on the thread and it will not pull through the machine the way it did when the presser foot was raised. Thread quality makes a difference on everything you sew. using old and dusty thread is not recommended because all that dust and possible disintegrating thread are all going inside your sewing machine and can damage the inner workings of your machine. Always test your sewing machine stitch on scraps of fabric before you begin sewing your project. That way if the machine is going to malfunction, you'll find out before you have damage done to your fabric that is possibly not able to be undone.